Gazebos sit outside all day, everyday, exposed to the humidity of the summer, the cold and snow of winter and the rain of spring and fall. A gazebo roof takes the brunt of this battering. A poor quality roof won't last long under these conditions, though a sturdy, well-built roof will. From hard plastics to asphalt shingles, the materials and designs available for durable gazebo roofs run a large gamut. 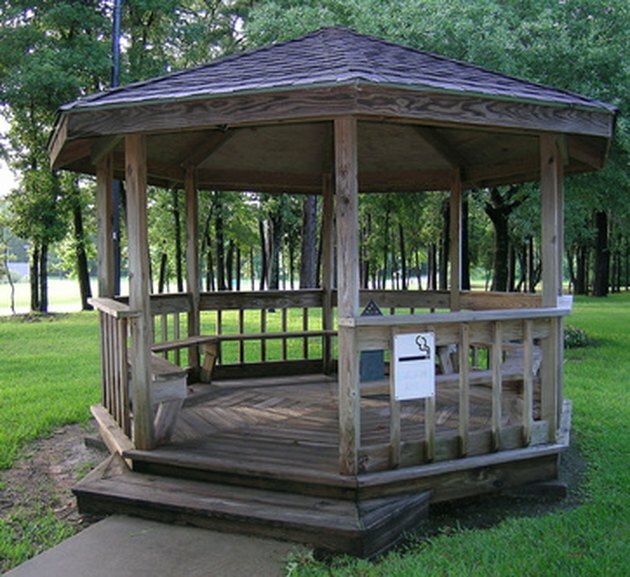 A gazebo roof must be built to withstand the elements. A number of shingle types are used in gazebo roof construction. Shingles provide strong protection from the elements because they are stacked in overlapping rows at a diagonal. The stacking of the shingles makes it difficult for elements like snow and rain to penetrate a shingled roof. Types of shingles that are used for roofing include asphalt and cedar. Asphalt shingles deteriorate less with heavy precipitation. Cedar shingles are recommended by Easy Outdoor Decor's gazebo guide because they "have a wholly traditional character and an organic, natural look… moss and lichen will grow on some shingles making your gazebo look even more a part of the natural landscape."